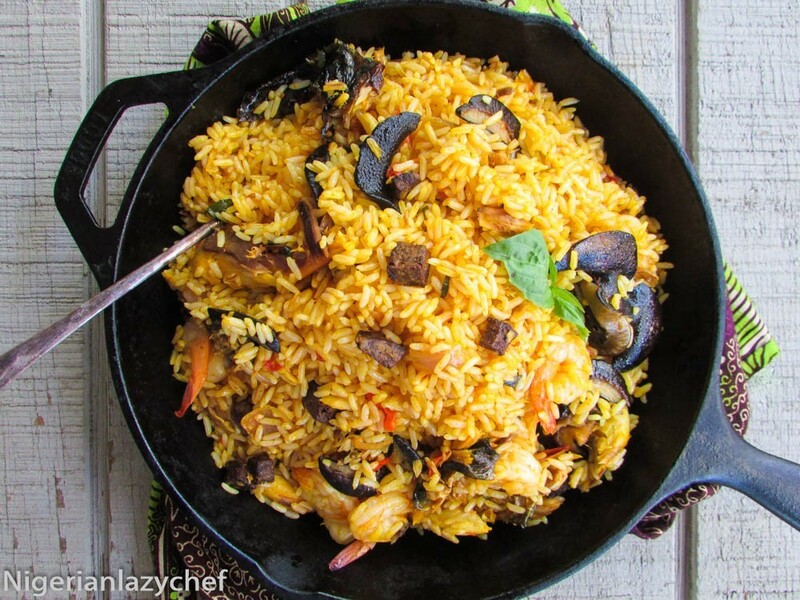 My friend and blogger colleague 9jafoodie asked a question to her Instagram followers and the question was “what has your vote as the ultimate Nigerian dish?” And my answer was Palm oil rice. Palm oil rice is even more delicious than Jollof rice. I know, I know; to you it may sound crazy to say that. But with Palm oil rice, the time frame for cooking is way easier than the regular Jollof rice. This recipe, though Palm oil worthy, is a little different from the everyday Palm oil rice. It is a little similar to the Nigerian fried rice and it just fascinates me how similar but different our recipes are. The thing I enjoyed about this recipe was the addition of the spicy cooked snails. They were tender, full of flavor and spicy; having steamed them with a habanero pepper, garlic and onion. The snails are then steamed with the palm oil sauce and in doing that, they soak in the sauce so that when you bite into them, they melt right into your mouth with a kapow of different flavors! You can also make this dish into a vegan or vegetarian dish by simply taking out the meat or protein and using only vegetables or tofu. Reading about it does no justice to this recipe. Making some is where it’s at! wash rice and cook with meat stock. 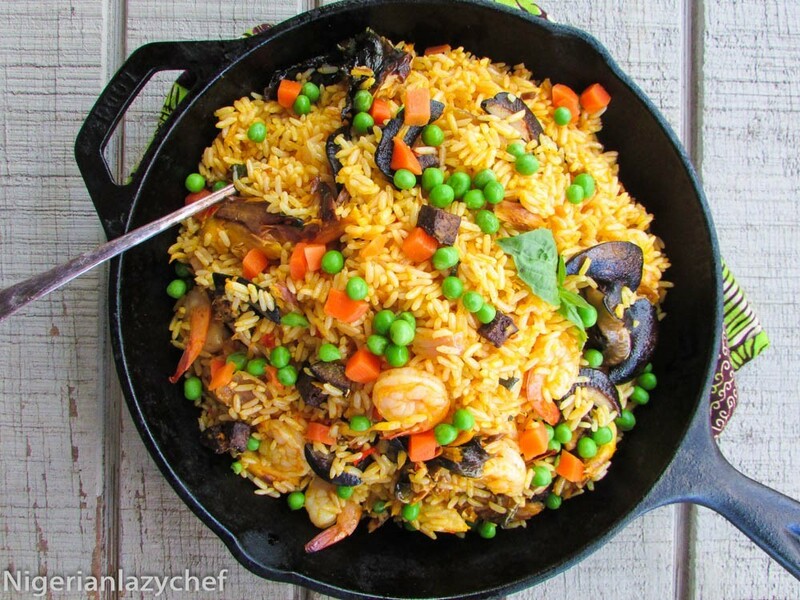 when the rice is aldente, spread on to a pan to cool down or simply place the pan into the fridge to quicken the process. Heat oil, add the onions and cook until translucent. Add the garlic and cook until the garlic is fragrant. Add the tomatoes, pepper and snails. Cook until the tomatoes have rendered. Season; then add the vegetables, liver and shrimp. Cook for another 3 minutes so the veggies are cooked and still crunchy and the shrimp is pink. Add the rice in little increments into the sauce and just keep stir frying on high heat until the sauce has very well coated the rice. add the Cameroon pepper and enjoy. This entry was posted in Gluten free Nigerian, gluten free nigerian recipes, Gluten free recipes, jollof, Local dishes, Local Recipes, Lunch, Lunch ideas, main dishes, Nigerian Fried Rice, Nigerian Rice Recipe, Nigerian rice recipes, Rice, Rice Dishes, Rice Recipes, Stir fries, Stir fry, stir fry recipes, Uncategorized and tagged Fried rice, Gluten free recipes, Iwuk Edesi, jollof rice, local jollof rice, Nigerian food blog, stirfried palm oil rice. I can’t wait to try this. It can pass as “African” paella. I am loving the idea of stewed snails..
Wow what a yummy recipe! i can’t wait to try this out asap. I’ve been looking for palm oil rice recipe for a while. Thank God I found this. I can’t wait to try it out.